Last weekend we enjoyed another Four Seasons Scottsdale staycation with friends. As I've mentioned before, this is one of our favorite destination spots in all of Arizona. It's so nice to have a world-class resort like this right in our backyard, and summer is the perfect time to take advantage of special rates. We checked in on a Saturday afternoon. And strolled to our room, where we were greeted with a welcoming gift. Which we enjoyed as we soaked up the stunning Sonoran desert view from our patio. As we waited for our friends to arrive, we decided an afternoon cocktail at Proof was in order. In relaxation mode, we likewise enjoyed the beautiful views here, sipping on a Mai Tai and snacking on lobster deviled eggs. Then it was time to meet our friends to start our evening plans. Live music by the talented Jared Blackstone on guitar, sunset cocktails, and fried oysters (thank you Chef Mecinas!) at Onyx before dinner at Talavera. 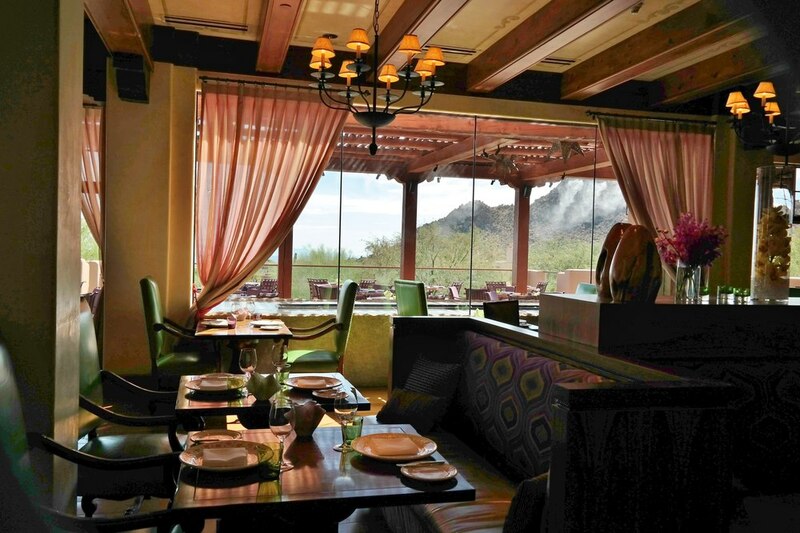 I don't think there is a more perfect spot than the terrace at Onyx to appreciate a spectacular Arizona sunset. On to the Taste of Talavera tasting menu with wine pairings. Although I've dined at Talavera a number of times, we had never done the chef's tasting. Chef Mel met with us to see if we had any allergies. He then asked us to look over the regular menu to choose if there was anything we wanted to include in the tasting (we chose the lobster bisque and octopus dish). Add to those, tartare with caviar, wagyu with foie gras, black cod with coconut risotto, and more, including Pastry Chef Lance Whipple's decadent peanut butter torte. From start to finish, it was amazing. Chef Mel's skills shone in this one-of-a-kind culinary splurge tailored for our party of four. At the close of our evening, Chef Mel proudly introduced his team so we would know who helped in the creation of this wonderful dinner. Bravo! Chef Mecinas and his crew! The next morning, we ended our relaxing staycation by meeting our friends back at Proof for brunch before our drive home. Another perfect weekend at the Four Seasons Scottsdale at Troon North.